Sylwia, the girl with the pink hair. Suicide Room is the story of Dominik, a Polish teen wrestling with the problems of his own emerging sexuality, career-driven parents and living in the world that doesn’t understand him. Poland. Just in case you’re unaware, being gay in Poland is not a great thing to advertise. Driven to living in his room by bullying and being repeatedly harassed online, Dominik finds solace in a group of online friends who inhabit the ‘Suicide Room’. It’s very easy to be trite about a film like this, a film which focuses on the problems of a teenager. A time in your life when emotions are felt more keenly and reactions often seem more dramatic or exaggerated. But the vibrancy of these experiences shouldn’t diminish their validity. Suicide Room is a film about something real and vital. Certainly in parts of the world where homosexuality is criminalised or marginalised to the extent that it is a social death sentence this is not an outlandish story. Jakob Gierszal is excellent as the awkwardly beautiful Dominik, curling and contorting his wire frame into all manner of tortured knots. Whilst his appearance and the subject matter veer dangerously close to a My Chemical Romance music video at times it’s held together through liberal and interesting use of the Suicide Room virtual community itself. A Second Life-esque virtual arena where the interactions of the characters are as genuine, if not more so, than their real life experiences. Here Jan Komasa can further explore the main overriding theme of the film, masks. 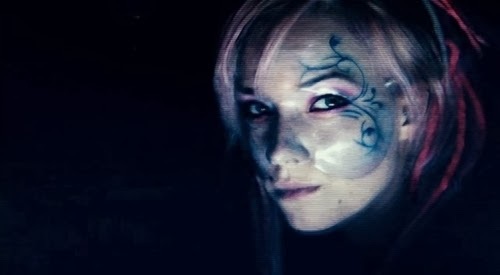 Dominik’s main contact in the virtual world is Sylwia, a pink haired mystery woman who rules the Suicide Room. She appears in webcam conversations wearing a clear plastic mask and reminding me of Mirror’s Edge character Faith. She is masked and somehow protected. It’s not a complex or even original exploration of the ‘We wear masks to the world’ concept. But it is effective. As a teen you are going through the process of tuning and manipulating your mask to acquire its final adult form. Dominik’s mask is fractured – he exposes too much of himself, literally. And in the age of constant, and instant, digital communication any weakness or crack in the armour is ruthlessly and immediately exploited by the pack mentality. In one scene in the Suicide Room a banished member rails against the avatars presented before him pointing out how their design seeks to cover the weakness of real life. Slender characters mask obese humans, muscle-bound hulks cover withered bodies. And in this space these compensating character avatars find the safety and solace they need. Perhaps Komasa is trying to say something about the need for more space. That by constantly exposing the masked and the protected we are forcing them further and further into darker recesses of the world. Perhaps. Either way, Suicide Room is a fine exploration of a very relevant set of issues using a classic motif.